Die-Pat fluorescent canopy hood light fixtures are available in sizes: 260mm x 667mm, 260mm x 972mm and 260mm x 1276mm. 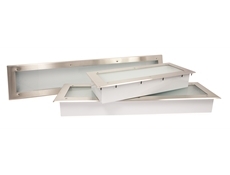 These light fixtures are recessed with low profile ( 4-1/2" (114mm) high ) and for use in commercial cooking hoods. Listed to 80°C (176°F) with tempered prismatic glass diffuser with one piece of satin finished stainless steel face frame to match hood interior.